The TechMatte Multi-Angle XL Portable Stand -- sleek, simple, two-tone colors beautifully compliment your device. 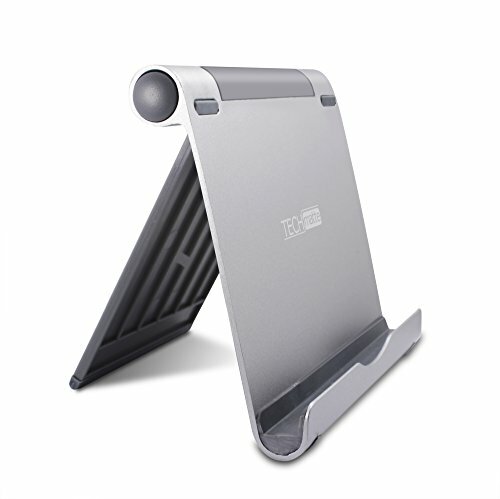 Made of durable aluminum, the Multi-Angle XL Stand can hold up to 11 pounds. One simple press of a button enables the 270-degrees of rotation to allow for the optimal viewing position. The angle adjustment is so versatile that it can accomodate anything from a large tablet to a small smartphone in both horizontal and vertical viewing positions. Great for use while reading, watching videos, viewing photos, searching the web and much more. The TechMatte Multi-Angle XL Portable Stand is also designed with non-slip liners, shelving and tabs to protect and safely hold your device in place. iPhone 6, 6 Plus, 5S, 5, 5C, 4S. Durable aluminum structure can hold loads up to 11 lbs. Dimensions: 5.5" wide x 5" high x 3/4" deep when fully closed; weight: 10.2 oz. If you have any questions about this product by TechMatte, contact us by completing and submitting the form below. If you are looking for a specif part number, please include it with your message.